An UPDATE to my race report. Remember when I mentioned the sign around Mile 1 that read "Believe! Go Mel!" and how I smiled and took it for me.... well GUESS WHAT? The sign was for ME!! Laurie HERE and her cute kiddos had put up the sign. Someone I have never met took the time to make me a BEAUTIFUL sign and post it before the race. I shed a few tears when Laurie let me know the sign was in fact for me. I knew I had a special connection to that sign. 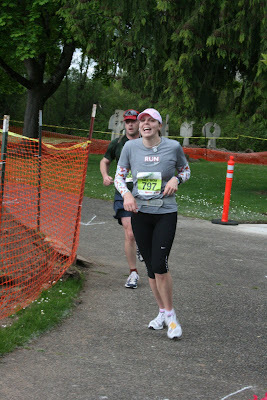 Thank you Laurie, the word "BELIEVE" repeated in my head over and over during the 26.2. I am still fighting with my Garmin to give me my STATS!!! 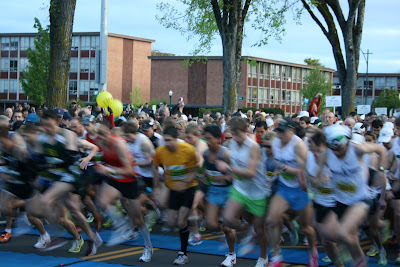 I was able to upload the pictures Muscle Man captured during the Eugene Marathon. 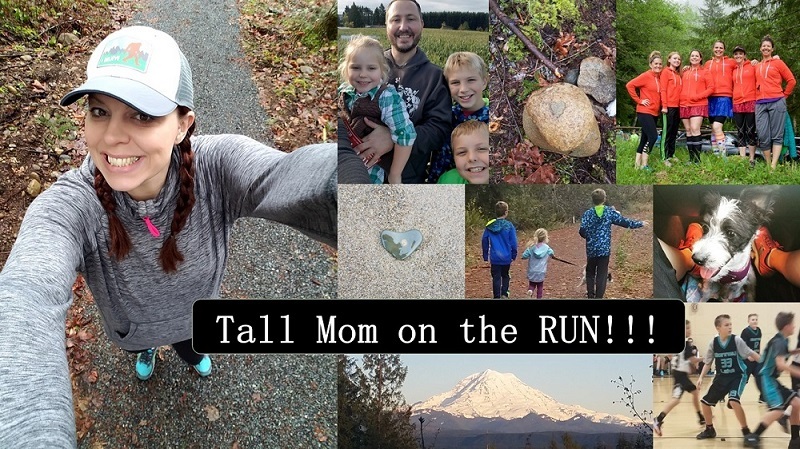 There are more on the Tall Mom Facebook page HERE. 40 minutes to race start. Drinking my Gu Brew, still calm and READY. At mile 3ish. Just after the picture the man to my right introduced himself "I am Will and I will be in your picture forever. 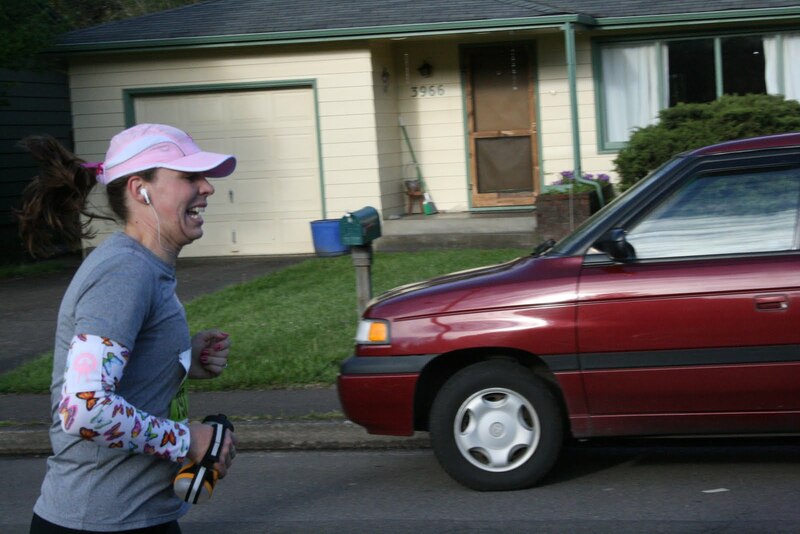 Mile 6, I opted not to swerve for a good picture. I did not want to waste precious energy. So this is a "Where's Mel" shot. It was REALLY Fun seeing Muscle Man over and over... and seeing Alisa. The crowd support was GREAT! Coming down after the BIG HILL on the course. I felt amazing, that hill training paid off. Just about Half Way and ready for a water hand off. 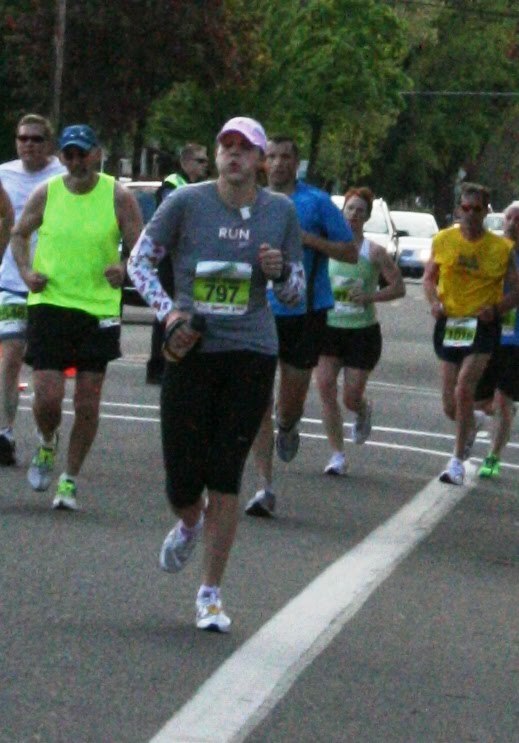 I look like a puffer fish, but I found that focusing on my breathing and form really kept me going. 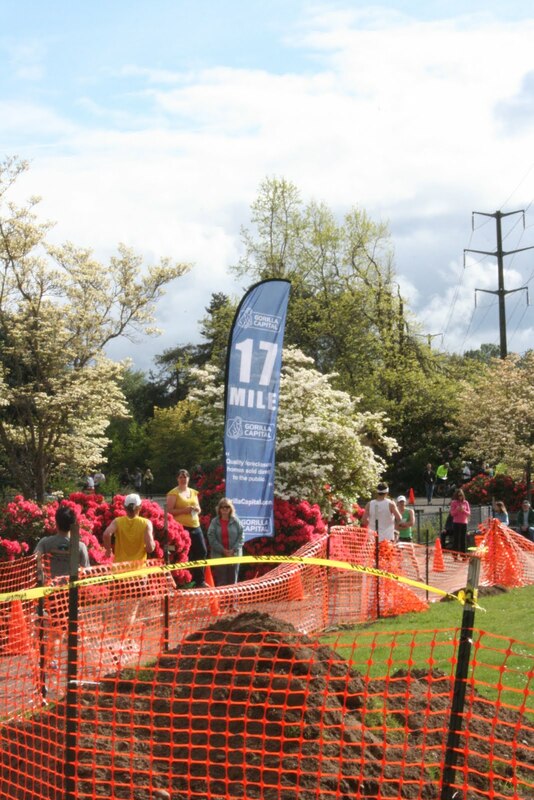 Mile 17 in a park under construction, looked like huge moles went to town. Yes I look like a DOOF, the dude behind me came out of the porta potty and started chatting. 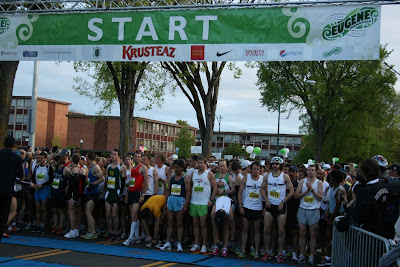 ?He asked me what my goal was, I said to qualify for Boston and he said "I gave up on that 15 minutes ago." Then he said bye and I kept going.. Feeling STRONG, I never hit the wall. 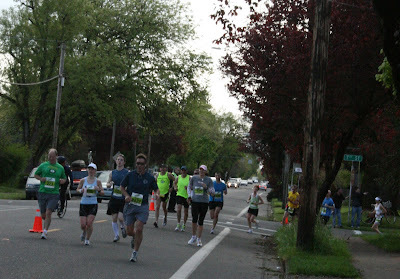 I slowed my pace, but I allowed myself to slow to conserve energy. Yes this is what I looked like at Mile 21, I had run out of water in my fuel belt and had to use water stops the rest of the race. 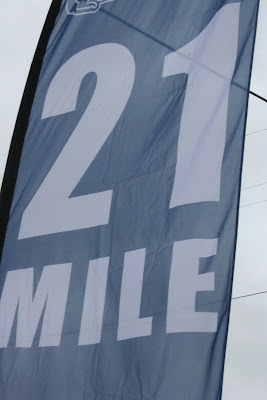 Miles 21-26.1 were grim, I slowed way down, then sped way up. People were dropping left and right. 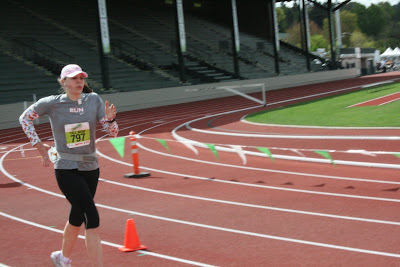 When I turned the corner into Hayward Field I thought about my running buddy Zoe. She has a killer finish line kick and we worked on that when we trained together. So I gave it my best Zoe effort and even passed a few people. I might change this to be my header on the Blog, what do you think? It was not easy. But I also knew that I was almost there. I closed my eyes, pumped my arms and sped up. I HOPE that the race photog got my finish line flex because that really captures the elation I felt at the Finish. Reunited with Muscle Man, covered in sweat, freezing and sporting my new amazing race medal. 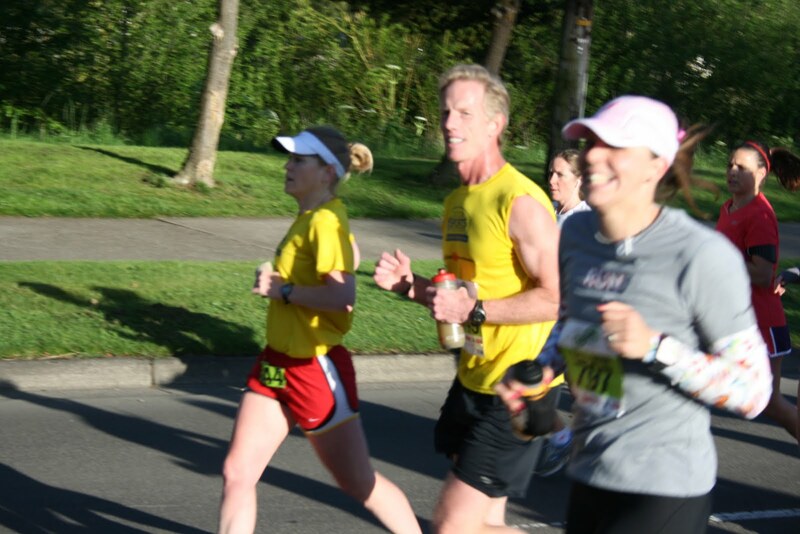 My race support and AMAZING hubby!! he texted some family and friends since I forgot my phone and the website tracker was not working... UGH!! Sorry folks, I was running and had no idea. 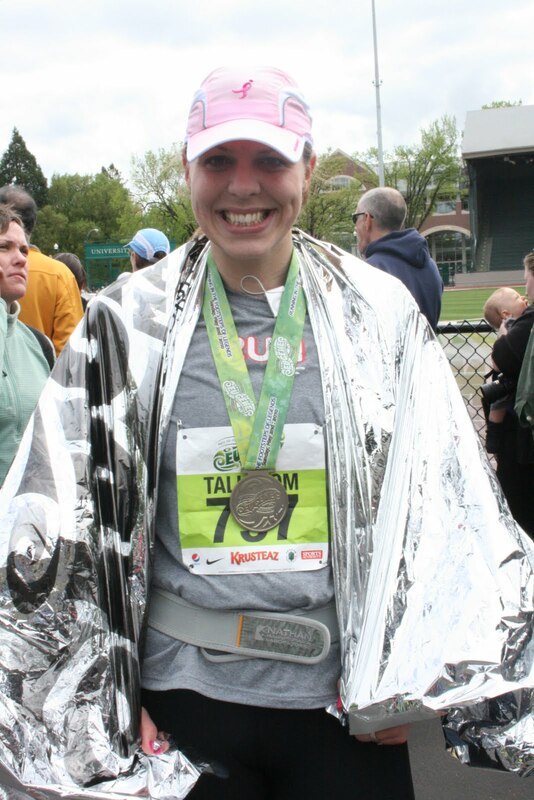 Tall Mom the Boston Qualifier done with Marathon #2 and happier than words can express!! Tomorrow we will be moving into our new home!!! I have the 3 High Fives 5K runners listed and will post tomorrow. 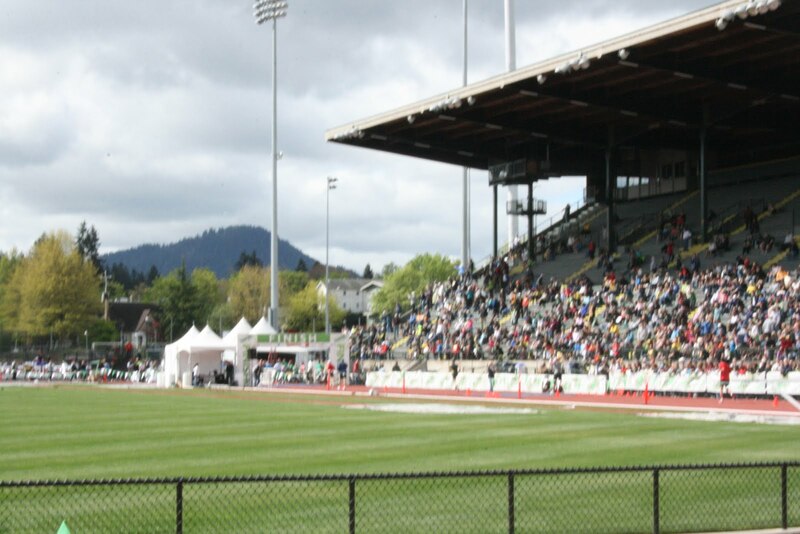 The Race Report will be delayed since I will be BUSY.. 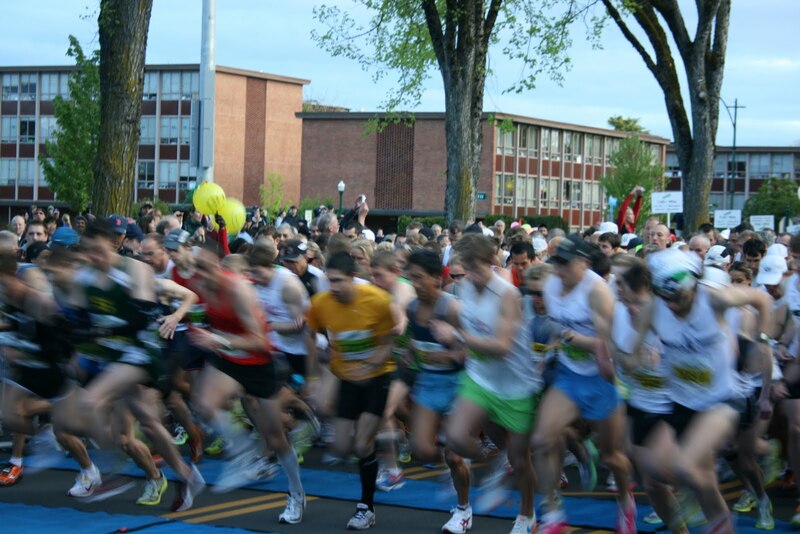 Still to come Eugene Marathon: Lessons learned, course review, stats, thank you's and official race photos. Great pictures, I knew you would do it! i told you the butterfly sleeves would do the trick! you look really slim and fit Mel! 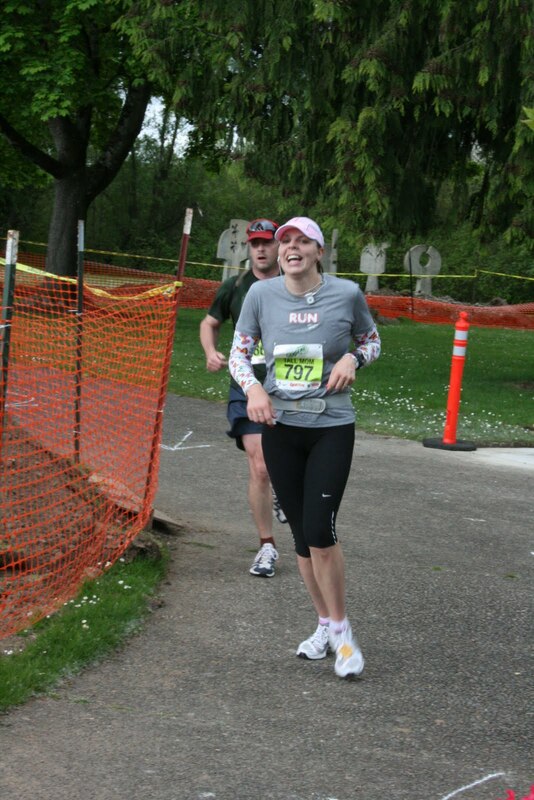 Please tell muscle man that i'm running a marathon in Alaska on june 19th and would love him to come photograph me! he did a GREAT job! The guy who told you he would be in your picture forever sounds creepy. :-) Great job again! T-Rex arms! I lol'd when I read that. Great work and congrats! Way to go Mel and have fun moving I hope you are recovered for it. What an awesome week. I love all the pictures! You are amazing! Congrats again on the BQ! I knew you would do it! Great photos and I do think you should make that pic your new header at least for now since its still so awesomely fresh! 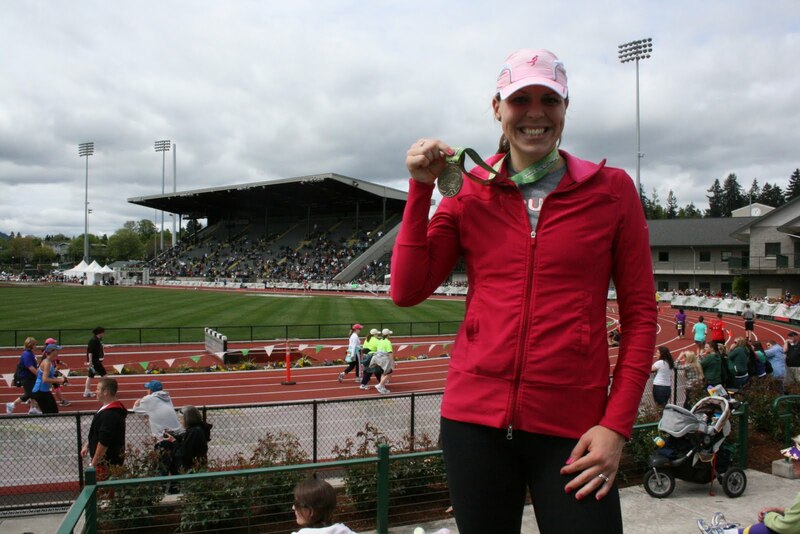 Congrats on your BQ, Mel! YOU WORKED HARD, EARNED IT, and DESERVED IT! WAHOO! 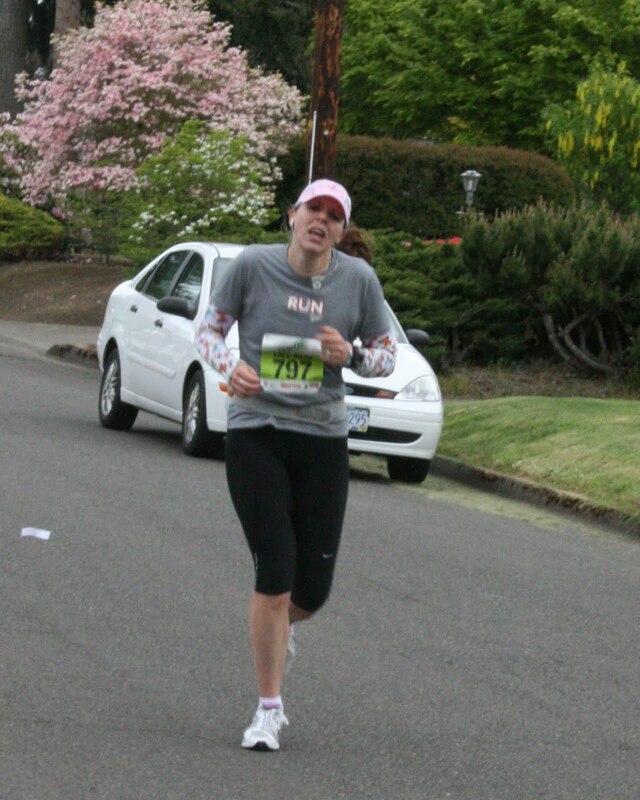 These are some really great pictures that truly display your last 26.2 mile journey to your BQ! I'm crying happy tears for you Mel! I know how badly you wanted this, and how HARD you worked for it, and I'm just so darn happy for you! And it gives me hope that one day I can do it too. These kids can't slow me down!! :) CONGRATS MEL!!!!! HAPPY NEW HOME DAY. Equally excited about that for you. Oh, and I almost forgot: CONGRATS on your BQ. Woo Hoo! I love the pictures! 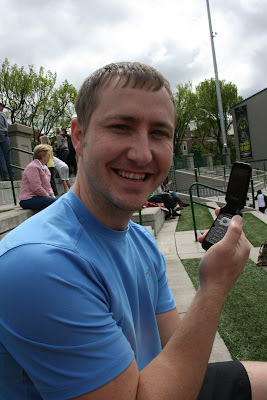 Your Hubbs was a great photographer. I know it meant the world to see them so often throughout the race. Love the picture for your header! Nice way to remember your BQ. 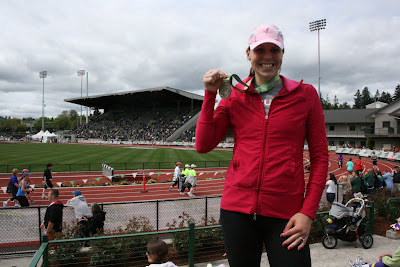 Forgive me as I'm sure I must be the last person on earth to offer my congrats on your BQ! Better late than never right? WTG! Great photos from the race! 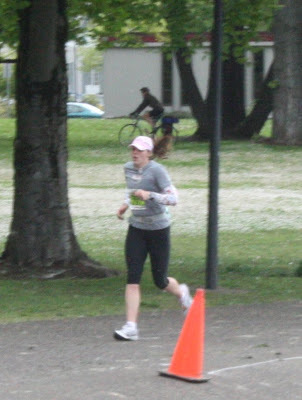 I look similar in many race photos! Just shows how focused you were!! cute pictures! Your hubby looks soo proud! Looks like a great race! You look so happy at the end! Congrats on running the marathon! thnx for sharing the pix! they are awesome. and u look so happy! How cool that the sign was for you! Love all the pics! I felt like I was there with you!!!!! 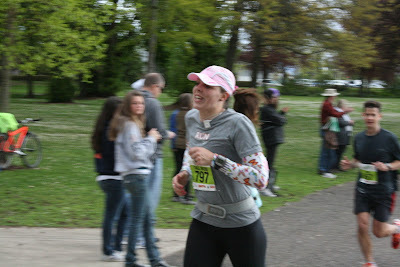 And I couldn't believe how fast this race was! The average time was like 3:44 or something like that! OKC average time was 4:40! So yours was a WAY faster crowd!!! Awesome! The pictures are awesome. MM did an excellent job and they really tell the story. I love the one youare considering for your header... so determined!! And SOOO sweet about the sign. Aww! Gosh, you are such an inspiration. I was rooting for you the whole way!! Way to put a goal out there and reach for it with everything. Congrats, again. Great pictures! Muscle Man did an awesome job as a spectator. 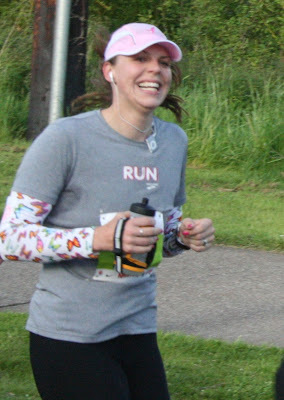 Nearly as awesome as you did running! Great pictures! Good luck with the move. Great pics! Congrats on the BQ! And good luck moving. I have cried tears of joy in your last two posts. 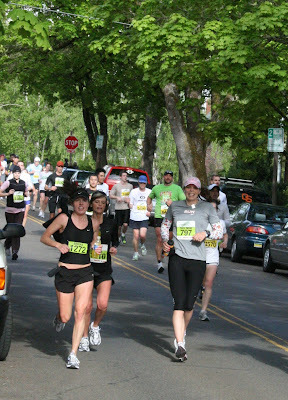 I follow you because I am half your size :)4'11", but share the common bond of running. 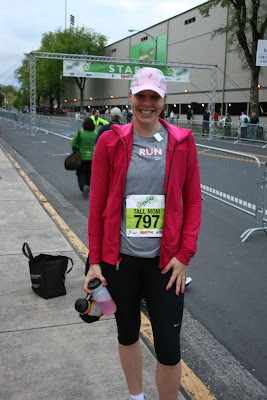 You made me very proud to be a wife, a mother, a daughter, a friend and a RUNNER! Way to go!!! What a journey. I loved seeing it in pictures. Congrats again Mel!! What great pictures and what in inspiration! I loved your recap and to follow through with pictures was so real. Congratulations again! I'm really glad you enjoyed the sign so much. Your pictures are great. You are truly inspiring, thank you. wow, you were a machine! in every pic you can see both your determination and your excitement - love it! congrats again, you totally deserve it : ) good luck with the move! 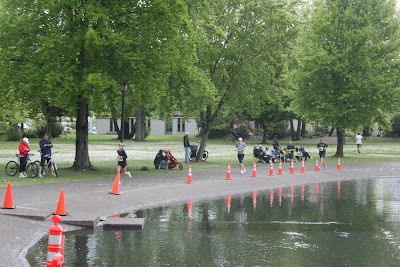 I love race reports that are in pcitures. Looks awesome. And I do not expect my husband to get pics like that for me. I doubt he will even get a finish line one. You look so happy in all of the those pictures! Congratulations! 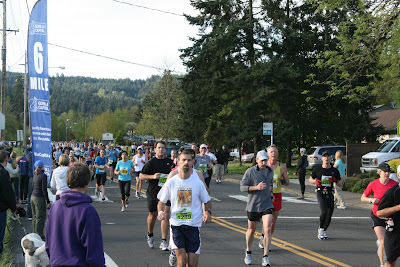 Nice pixs, I love how the attire of the folks around you changed as you got further into the race. Awesome recap and CONGRATS!! You are amazing. That is such great news about the new home and the BQ!!! Lots of good things happening now :) You deserve it!!! Great pictures Mel! Lucky you to have such a great photographer. You rock girly! And can I just mention how your BQ makes me really want to run another marathon? 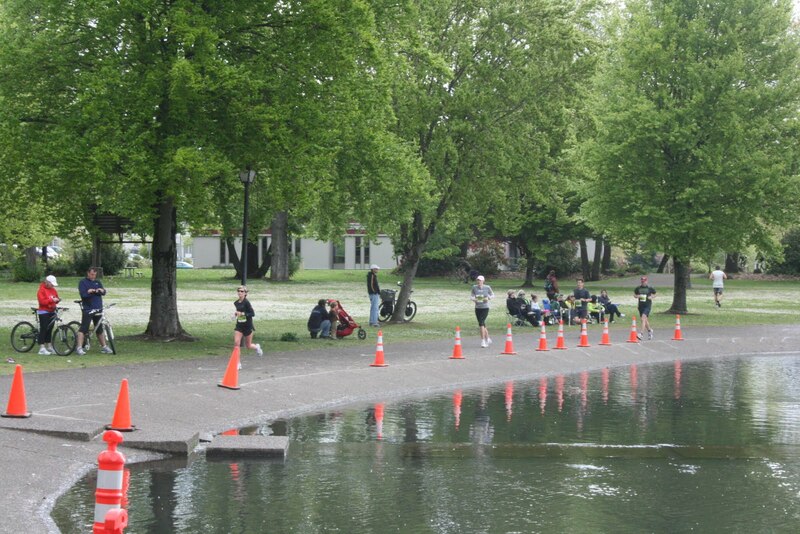 such a bad case of runner's envy! Congratulations! Great pictures. Feel like we were there with you!! Love the pictures, thanks for sharing! Great pictures!! I love the T-Rex arms - LOL, I have those too. Good luck with your move! Great pictures! Your husband obviously did a fantastic job supporting you AND taking pictures! Congrats again on an amazing race! Such awesome pictures! You worked hard for this and you definitely deserved it. What an amazing race! Awesome pictures!!! Congrats on an amazing race! Love the photo journal! Still so happy for you! You're amazing! AWESOME photos to remember the journey, way to go Muscle Man! You did so good! Congrats again! I keep looking at these pics over and over just remembering the times running with you...and I totally knew you could make Boston. What an amazing marathon for you! It truly was your day! 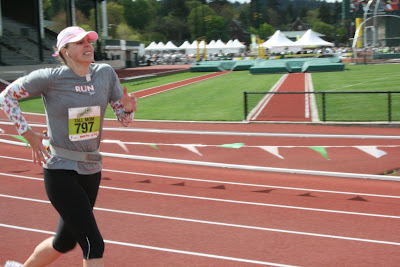 And of course, I'm proud that you found your inner finish line kick! It's tough, but it feels amazing to pass people (and finish asap!). :) Proud of you, Miss Tall Mom Boston! Oh Mel!! Way to go, what a great accomplishment and SUPER great pics! YOU are so positive and such an inspiration and blessing! Can't wait to read more!! That is SOOO cool that she made a sign for you! I LOVE all the pictures! Great, great job. Congrats again! The photos are awesome!!! So nice that you have so many to remember your big day! Congratulations! You are amazing! Thanks so much for doing this blog and letting me follow along on your journey. you got so many pictures! I'm amazed and I love the sign!! Hope the new house is treating you well. Congrats on a great race and your BQ! Funny, I saw that sign out on the course and wondered if it was for you! So very cool that your reader did that for you. Yayyyy for the BQ! You're such an inspiration. :) Your pace was phenom!! WOW!!!! Loved the pictures and you did so awesome. You never hit the wall and you are now a marathoner! Great job. Great pics ... and how awesome about the sign! Really special.